At a small farm in northern Italy one woman is on an impossible mission - to save the nation's pigs from becoming salami. As Federica Trivelli enters one of her four pig sties, the animals rush about her, honking with pleasure. She says that even if someone were to blindfold her she would know which pigs in La Piccola Fattoria degli Animali or the Little Animal Farm - were talking to her. "Each has its own voice. Some make a deep noise, some make a sort of hissing," she says. "One of the pigs makes a noise that sounds like a sort of trumpet." One little piglet has the nickname "little boiler" for his incessant huffing and puffing. There are scars all around his neck from injuries that he suffered at his previous home. In fact, Trivelli's Little Animal Farm, in the Piedmont region of northern Italy overlooked by snowy Alpine peaks, is not a farm at all, but a sanctuary for abused pigs. Trivelli empties cereal flakes mixed with water into their bowls and the noisy sty becomes quieter as the pigs contentedly gobble down their food. "You can receive a call at any moment of the day or night," she says. "I'm ready 24/7. I'm constantly talking with the police, with the forest guard, with environmental organisations. They call me and say: 'I've got some pigs for you. How many can you take?'" At the moment she has 20 pigs, gathered into four herds according to size. The first one, a Vietnamese she called Bombi, arrived on her 36th birthday in 2009. Already an animal activist, Trivelli had been visiting farms and slaughterhouses for almost 20 years, but this was the first time she had felt driven to take an animal into her care. "He was living with some very unpleasant people," Trivelli recalls, adding that she and her activist friends initially struggled to see how they could help the animal. "We didn't want to buy him, we didn't want to give money to those disgusting farmers, so we bartered with them and swapped the pig for some gym equipment - and agreed to repaint some of their sheds." She takes in pigs from across the country. One piglet was found discarded in a plastic bag in Palermo, in Sicily. Trivelli put out a call for help on an animal rights mailing list, and volunteers transported him by relay up the entire length of the country. Trivelli named him Spartacus, after the slave that led an uprising against the Roman republic, to signify the food revolution she is hoping to start - her dream would be a world in which no-one eats meat, and certainly not pork. On her Facebook site, Trivelli retells his journey as a heroic campaign through Italy. "The crowd cheers the arrival of Spartacus and, once again, the gladiator wins!" she writes of the pig's passage through the capital. "Rome is free from slavery and the city celebrates the triumph of freedom, honouring all fallen brothers in battle and those forced to live in chains." Another pig, now an enormous hog called Yoda, was just 10kg (22lb) when she came into Trivelli's care, after being left on the back of a truck at a motorway service station. Other pigs that she has cared for had been kept in chains, unable to move around. Some had been fed rotten food - one was even given the remains of the farm dog. "It's like a David Lynch movie, a horror movie," Trivelli says. "Sometimes I would like to beat up the farmers and butchers but it wouldn't help. I have learned to use diplomacy and to smile at them." All too often, in her experience, Italy's pig welfare standards fail to live up to the illustrious reputation of its hams and salamis. In 2013, the campaigning group Compassion in World Farming visited 11 pig farms, and found that none of them met the EU's directives on pig welfare. They documented pigs standing in excrement in gloomy overcrowded sheds. Nearly all had had their tails docked - a practice banned by European law since 2003 - because pigs in cramped conditions, without any straw or other distractions, start to chew them off. The speciality hams for which Italy is famous are made from pigs that have already reached sexual maturity and must therefore be castrated to prevent the meat taking on an unwanted flavour - a procedure generally performed without anaesthetic. The Italian Ministry of Health - which oversees farming standards - has pointed out that Compassion in World Farming's investigation was limited to just 11 farms. In 2013, the Ministry itself inspected almost 2,000 pig farms and found that a majority complied with EU guidelines, though 38% did not. Trivelli - a vegetarian for almost 30 years - says she would like to see every pig in the country moved from farms into a sanctuaries like hers. "If I were a billionaire I would take them all," she says. In a country where the rural calendar still begins with the annual pig killing - a winter festival of blood-letting and sausage-making - this is not a mainstream point of view. Trivelli's animals die natural deaths, and unlike most farmed pigs they grow to their full size. One of the largest is a boar with bluish inkblot markings on his hide. At nearly five years old, Billo weighs between 350 and 400kg, and is Chief Pig on Little Animal Farm. "Despite being leader, he is very balanced, he's not violent," says Trivelli. "If somebody does something that he doesn't like, if somebody tries to eat from his bowl for example, he simply stares at them and it's enough." She has no hesitation in hugging and kissing the animals, and treats them in every way like pets. They are far more intelligent, she says, than her seven cats and six dogs. The pigs quickly learn their names and phrases like "go inside", and smack their lips to ask for water. One piglet was toilet trained in just a week, banging its snout on the metal gate to its enclosure when it needed to go. 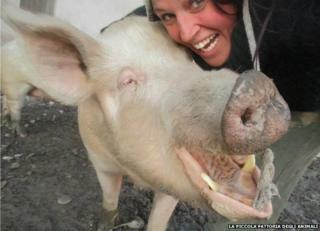 As for emotional intelligence, Trivelli says the pigs know when she's feeling unwell, and tone down their oinks. Each herd on the farm has its own large sty, and every morning the herds take turns to be released into a central patch of mud known as the "toddling area" to run around, foraging and digging big holes in the mud, while Trivelli and volunteer helpers refresh their hay and water. Trivelli spends five or six hours every morning doing this, before going to her part-time job as an architects' secretary. Every weekend, and every penny of her income, is given over to the pigs. "I never go to restaurants, I never buy designer clothes or bags," she says. "I don't go on holidays and I'm not bothered about having a fancy haircut. If I need to buy anything I just go to the market and get the least expensive thing I can find. All my savings are for the pigs. "It's almost like a vocation. There are people who are keen on helping children or elderly people or people in developing countries. I have a true passion for animals. My ambition in life is to save pigs." Maurizio Molinari's report on the Little Animal Farm appeared on Outlook on the BBC World Service. Listen to the report on iPlayer or get the Outlook podcast.